NOTICE: Activation key must be used on a valid Steam account. Requires internet connection. About the gameDuring a long-passed archaeological excavation, a set of Gates were discovered. People quickly realized that these ancient passages lead to different realms and dimensions – providing brave and reckless adventurers with treasures beyond measure. 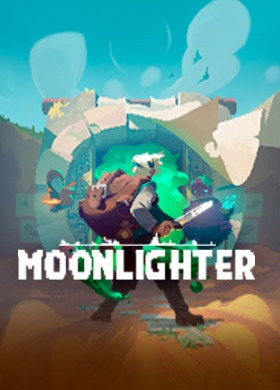 Rynoka, a small commercial village, was f… ounded near the excavation site providing refuge and a place for adventurers to sell their hard-earned riches.Moonlighter is an Action RPG with rogue-lite elements following the everyday routines of Will, an adventurous shopkeeper that dreams of becoming a hero. Key FeaturesRun Your Own Shop While conducting your business in Rynoka village, you can put items on sale, set their price carefully, manage gold reserves, recruit assistants and upgrade the shop. Be careful though – some shady individuals may want to steal your precious wares!Fight With Style Defeat various enemies and bosses, and revel in challenging and deep combat mechanics. Masterful control of your weapons, critical timing, careful positioning, and an understanding of your enemies and environment are crucial to your survival. How you battle your enemies is up to you.Restore the Village Get to know your neighbors as you restore the prosperity of this small commercial hamlet. Help establish new businesses and watch them grow in the idyllic community of Rynoka.Craft and Enchant	Understanding the crafting and enchanting system is essential for your progression. Interact with the villagers to craft new armor and weapons, and enchant existing equipment. This creates a great deal of flexibility and spices up the way equipment is used.Get the Loot Access strange worlds through otherworldly gates and collect valuable items from exotic civilizations: resources, weapons, armors and peculiar artifacts. Hoarding everything won't be possible - use the unique inventory system wisely to take the most profitable loot with you.Open the Gates	Gates lead to different worlds. Each run is unique and forces you to make smart and calculated decisions. You never know what you will encounter next – that’s why you must be prepared for everything. System Requirements Windows - Minimum OS: Windows 7/Windows 8 Processor: Intel(R) Core(TM)2 Quad 2.7 Ghz, AMD Phenom(TM)II X4 3 Ghz Memory: 4 GB RAM Graphics: GeForce GTX 260, Radeon HD 5770, 1024 MB, Shader Model 3.0 Storage: 2 GB available space Sound Card: DirectX compatible Windows - Recommended OS: Windows 7/Windows 8 Processor: Intel(R) Core(TM) i5 Memory: 8 GB RAM Graphics: GeForce GTX 660 Storage: 2 GB available space Sound Card: DirectX compatible Mac - Minimum OS: 10.6 Processor: Intel(R) Core(TM)2 Quad 2.7 Ghz, AMD Phenom(TM)II X4 3 Ghz Memory: 4 GB RAM Graphics: GeForce GTX 260, Radeon HD 5770, 1024 MB, Shader Model 3.0 Storage: 4 GB available space Sound Card: Integrated Mac - Recommended OS: 10.6 Processor: Intel(R) Core(TM) i5 Memory: 8 GB RAM Graphics: GeForce GTX 660 Storage: 4 GB available space Sound Card: Integrated © 2018 11 bit studios S.A., 11 bit studios™ and respective logos are trademarks of 11 bit studios S.A. All rights reserved. Digital Sun™, Moonlighter™ and respective logos are trademarks of Wildframe Media. All rights reserved.